Where will you be needed as a physician? The United States currently faces a shortage of 20,000 physicians, but which areas need the most help? Medically Underserved Areas are where most financial incentive programs aim to recruit physicians, but some states use alternative terms to describe the areas in need. Below is a list of relevant definitions to describe the areas where financial incentive programs seek to recruit physicians. Medically Underserved Areas/Populations are areas or populations designated by HRSA as having: too few primary care providers, high infant mortality, high poverty and/or high elderly population. Health Professional Shortage Areas (HPSAs) are designated by HRSA as having shortages of primary medical care, dental or mental health providers and may be geographic (a county or service area), demographic (low income population) or institutional (comprehensive health center, federally qualified health center or other public facility). 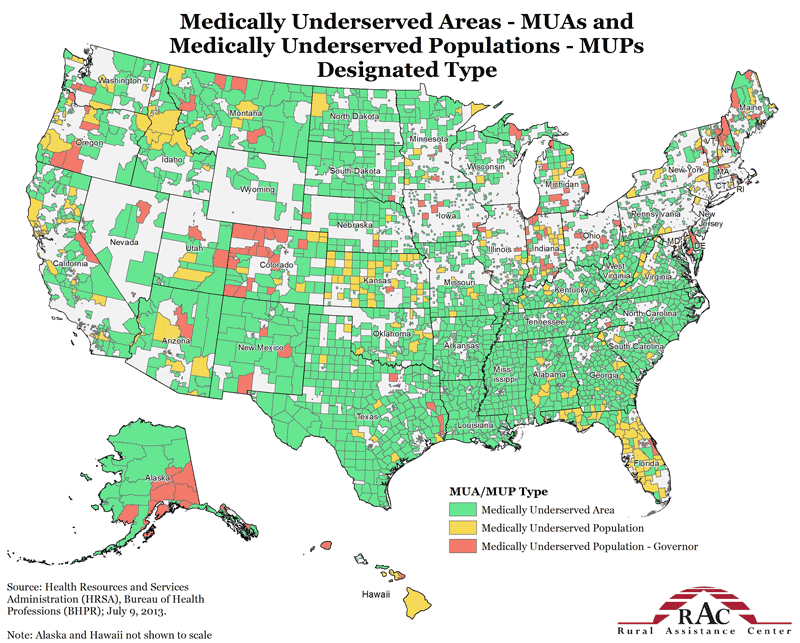 Search for Medically Underserved Areas by State and County here. (Source: U.S. Department of Health and Human Services Health Resources and Service Administration (HRSA)). Population groups with economic barriers (low-income or Medicaid-eligible populations), or cultural and/or linguistic access barriers to primary medical care services. The term is defined and used several places in the PHS Act in order to give priority to such areas for Federal assistance. (Source: Montana Bureau of Primary Health Care). Learn More about the distinction between MUAs and MUPs and how each are designated here. A governor's Medically Underserved Population (MUP) designation is a type of MUP that exists to address special circumstances. Under the provisions of Public law 99-280, enacted in 1986, a population group which does not meet the established criteria of an Index of Medical Underservice (IMU) less than 62.0 can nevertheless be considered for designation if "unusual local conditions which are a barrier to access, or the availability of personal health services exist and are documented" and if such a designation is recommended by the chief executive officer and local officials of the State where the requested population resides. These areas are not eligible for rural Health Clinic (RHC) certification. Requests for designation under these exceptional procedures should describe in detail the unusual local conditions/access barriers/availability indicators which led to the recommendation for exceptional designation and include any supporting data. Such requests must also include a written recommendation for designation from the governor or other chief executive officer of the State (or State-equivalent) and local health official. (Source: Louisiana Bureau of Primary Health Care). HPSAs are defined service areas that demonstrate a critical shortage of primary care physicians, dentists, or mental health providers. A HPSA can be a distinct geographic area such as a parish or grouping of census tracts, a specific population group within a defined geographic area (such as a population under 200% poverty), or a specific public or non-profit facility such a state hospital. More information regarding distinctions between the above terms can be found here.